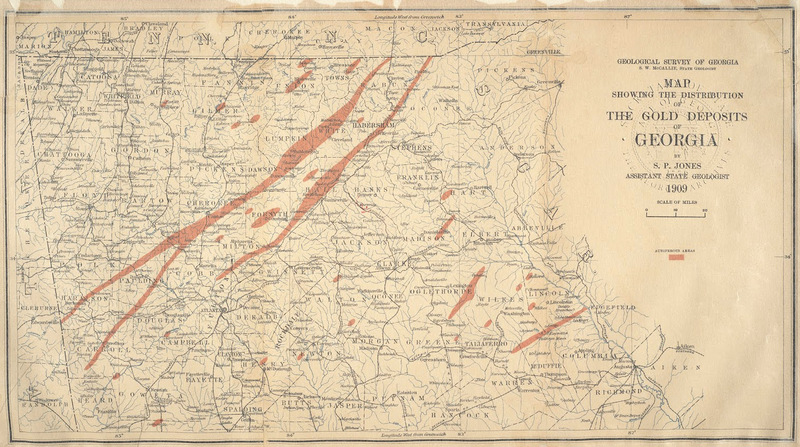 Georgia was once a popular gold mining destination in the 1800s. In fact, it was the best state in the eastern US to search for gold. There were several good areas in this state to find pure gold. But most of the gold prospectors in Georgia moved out west once the California gold rush started. Dahlonega was the most popular gold mining city in Georgia. The US Mint even had to open their own branch in Dahlonega. This city located in the 'Georgia gold belt' and you can still find gold in the rivers and creeks near Dahlonega. The most common places to mine gold were near rivers in North Georgia. Take a look at the map below to see the hot spots. The dark areas are where gold deposits were found. Click the image to see a larger resolution. The gold found in Georgia is distinct. It's very pure, usually above 23 karats. Therefore Georgia provides some of the purists gold deposits in the country and the entire world. You can find gold in both lode and placer deposits. This is common with states in the southeastern US. In addition to gold you can also find gemstones and rubies. Below is a list of the best rivers and creeks for gold prospecting. If you can find any sign of old mining activity, then you're probably in a good spot. If you live in North Georgia, then it's best to join a prospecting club because they can tell you what all the local laws and regulations are. They also have their own member-only prospecting areas. Located in Cherokee County, this river runs through most of North Georgia- including the city of Dahlonega. On this river you get fresh water that comes in through the North Georgia mountains. Placer deposits were found here back in the mining days. There are also several different tributaries and creeks that make for good hunting spots. The Little River is a tributary of the Etowah River, and the banks around this River can provide placer gold. Back in the day there were plenty of old mining operations nearby. Located in White County, this river is 430 miles long. There are several other small creeks in the area that drain into the Chattahoochee River. This river and any nearby creeks have gold-panning potential, as White County was a key area during the gold boom. There are also some National Forests located on this river where you can camp out and take your time panning. The Chestatee River is is a major tributary of the Chattahoochee River. It had several mines back during the peak of the Georgia gold rush. The Tesnatee Creek is a tributary to the Chestatee River. It looks more like a river because of its width, but technically it's a stream. This stream is where several old mines once operated. The National Forests in Georgia are a good place to enjoy nature and to pan for gold. The rules are that you can only use a gold pan and a shovel. This means you can't use any heavy equipment like dredges and sluices. Lake Allatoona in particular is a great campground option. There are actually eight different camping grounds at Lake Allatoona and most of them are close to where you can pan for gold. You wouldn't need to travel far from your tent or RV to pan in the creeks. The mines listed below were once fully operational gold mines. But the full-fledged mining has stopped and they are now educational centers. You probably aren't going to get rich searching at these public gold mines. However they can be fun to visit and it makes for a good family outing. Located in Cleveland Georgia and only 90 miles northeast of Atlanta, Gold'n Gem Grubbin is a historic gold mine that provides a unique experience. The company's goal is to make it feel like you are back in time, searching for gold in the 1800's. Here you can pan for gold in the creeks or buy dirt and put it through the sluice to see if you get lucky. You also have the option to stay overnight in either a tent or an RV. Dukes Creek Gem & Mining Co. Located in Helen Georgia, this is a nice place for families and the staff is really helpful. Here you can learn how to pan gold the proper way. There are panning tables where you pay for a bucket of dirt that was mined nearby in Duke's Creek, which was home to one of the biggest gold rushes in the country. There are different bucket options to choose from. Located in Dahlonega Georgia, this is one of the oldest mining establishments in North Georgia. It's no longer a full-time mining operation- it's now a museum and educational center. With a $11 admission ticket you get a tour of the mill and the mining equipment museum, gold dirt to pan through, and a bucket of gemstones to search through. It's a fantastic deal. Georgia is a good state for gold panning. However it's probably not worth visiting Georgia just for the gold potential. But if you are already in Georgia then you should try out one of rivers, or bring your family to one of the commercial gold mines.